Find this book at Amazon.com | buch7.de | eurobuch.com | buchhandel.de | books.google.com ASIN=0553804367, Category: Science, Language: E, cover: HC, pages: 176, year: 2005. What puzzles me is that Charles Seife in "Alpha & Omega : The Search for the Beginning and End of the Universe" did not mention Stephen Hawking except in a single footnote about black holes. 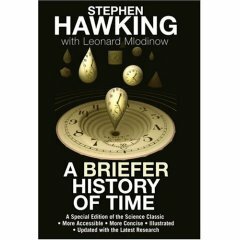 But I enjoyed reading Stephen Hawking's "A Brief History of Time" when I was a student and I'm looking forward to read his even briefer history of the universe when I'll unwrap his new book under the Christmas tree. The science classic made more accessible and more concise. Illustrated. Updated with new research. This is the origin of and the reason for A Briefer History of Time: its author's wish to make its content accessible to readers - as well as to bring it up to date with the latest scientific observations and findings. Although this book is literally somewhat 'briefer', it actually expands on the great subjects of the original. Purely technical concepts, such as the mathematics of chaotic boundary conditions, are gone. Conversely, subjects of wide interest that were difficult to follow because they were interspersed throughout the book have now been given entire chapters of their own, including relativity, curved space and quantum theory. This reorganization has allowed the authors to expand areas of special interest and recent progress, from the latest developments in string theory to exciting developments in the search for a complete, unified theory of all the forces of physics. Like prior editions of the book - but even more so - A Briefer History of Time will guide non-scientists everywhere in the ongoing search for the tantalizing secrets at the heart of time and space. If we do discover a complete theory, it should in time be understandable in broad principle by everyone, not just a few scientists. Then we shall all, philosophers, scientists, and just ordinary people, be able to take part in the discussion of the question of why it is that we and the universe exist. If we find the answer to that, it would be the ultimate triumph of human reason - for then we would know the mind of God.